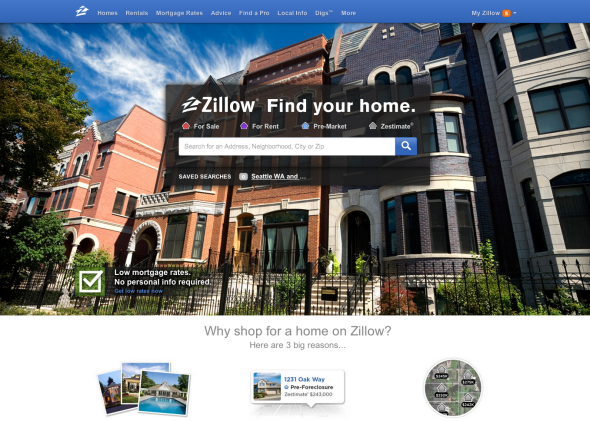 Zillow acquires Trulia, could become the Facebook of homes. Zillow’s $3.5 billion acquisition of Trulia creates a real-estate data giant. The two biggest U.S. real estate websites are about to become one. Zillow, No. 1 in the category, announced Monday that it is buying Trulia, which was No. 2, for $3.5 billion in stock. The acquisition not only will make Zillow a household name (sorry), but could also give it leverage to reshape what has long been a remarkably fragmented industry. This is probably not great news for realtor groups, nor for traditional real estate companies like Re/Max or Coldwell Banker. Perhaps even more importantly in the long term, the deal consolidates the two companies’ data, creating a unified database of home values and real estate trends that will be hard for anyone else to match. For now, both Zillow and Trulia will continue in their present form. That makes sense, given that there’s less audience overlap between the two sites than you might think. Two-thirds of Zillow’s visitors do not use Trulia, and half of Trulia’s visitors don’t visit Zillow.com, according to Zillow’s blog post announcing the deal. There is, however, plenty of overlap between the two sites’ functionality. Both try to offer as many listings as possible and cater to buyers (or renters) and sellers alike. Zillow is probably best known for its “zestimates,” which allow users to look up the estimated current market value of some 100 million homes across the country. As Time points out, Trulia has prettier data visualizations, including heat maps of local crime rates and commute times. 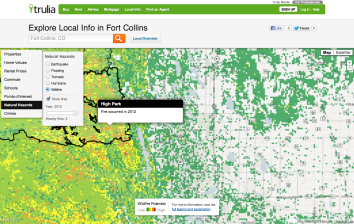 Trulia’s heat maps cover crime rates, commute times, and even natural hazards. Ultimately, Zillow CEO Spencer Rascoff told the New York Times, the goal is to create a portfolio of real estate sites under a single corporate umbrella. That’s not unlike what IAC has done with its dating sites, which now include Match.com, OKCupid, Tinder, and HowAboutWe. The analogy is especially apt because both the online real estate industry and the online-dating industry are built on data, albeit in different ways. For dating sites, the emphasis is on mining affinity patterns to hone personalized recommendations for each user. That may be important down the road for real estate sites as well. But in the near term, Zillow is likely to focus on establishing itself as the country’s most comprehensive searchable database for home listings. That, in turn, will allow it to keep improving its “zestimates” to the point that it becomes, in a sense, the Facebook of homes. Zillow was already headed in that direction when I met with Rascoff, the CEO, earlier this year. “A house is kind of like a whale,” Rascoff told me, in the sense that it surfaces on the Internet only for a brief period while it’s on sale. “When it goes off the market, it disappears.” But Zillow can harness data on the other homes in its neighborhood and category to chart its estimated value even while it’s off the market. It also encourages homeowners to feed it additional information by setting a “make me move” price even when their home is off the market. You may not be looking to sell just yet, but if someone offered 25 percent above market value, you’d listen. By making that information available to potential buyers, Zillow gives you the chance to reap an unexpected windfall. For its part, Zillow reaps additional data about the value of your home—and a bunch of other homes like it. These days, Rascoff said, people don’t just look up their dates, bosses, and ex-spouses on Google and Facebook. If they know their address, they also “Zillow” them to find out how much their home is worth. Just now I Zillowed my parents’ home, and the “zestimate” looks pretty plausible, even though it hasn’t been on the market in decades. The information on the house’s size and build date is also accurate. Zillow’s data on housing does raise some privacy concerns, as Evan Selinger pointed out in Slate in 2012. But the company doesn’t disclose homeowners’ identities, so it won’t tell you anything about a person’s home unless you already know his address. The Facebook analogy is imperfect, of course, in that Zillow isn’t a social network. Rascoff prefers to think of his site as a “Wikipedia of homes,” in that it conveniently ties together factual information from disparate sources. Unlike Wikipedia, though, Zillow doesn’t allow just anyone to upload information about a given property—only the owner or agent. Not yet, anyway. Either way, the database is incredibly useful for those looking to buy or sell. In theory it could have a lot of value for academics and policy-makers as well. Already, the company says, four out of every five homes in the United States has been looked up by at least one person on Zillow. Rascoff told the Times he doesn’t expect any antitrust regulators to object to the Trulia acquisition, because the companies’ combined revenues of $341 million last year represent only a fraction of the multibillion-dollar market for real estate ads. Perhaps he’s right. But the portion of that pie that goes to online sites and mobile apps is likely to grow in a hurry, and keep growing—and Zillow will be poised to gobble it up, much as Amazon has done with online retail. In some ways it would have been nice for consumers to continue to have two big real estate sites battling it out and keeping each other’s power in check. That said, perhaps we should be thankful that it was Zillow that bought Trulia, and not some far larger tech company. The Facebook of homes would be a lot scarier in the hands of, say, the Facebook of people. *Correction, July 28, 2014: This post originally cited Bloomberg’s calculation that the two sites captured nearly 90 percent of all traffic to ComScore’s top 15 real-estate sites. In fact, according to ComScore, the combined unduplicated audience for Zillow and Trulia is 68.4 million, which works out to 71 percent of the total audience for the real estate category.